From Maschine to Fruity Loops, the trend in music production is steadily going toward mobile applications. Using your iPad or iPhone along with a traditional DAW setup is a great way to expand your workflow and hash out ideas on the go. There are also easy ways to use your iPad wirelessly as a controller for your DAW. Simply put, if you’re not using your iOS device in conjunction with your computer’s DAW, you’re missing out on a world of control and opportunity. 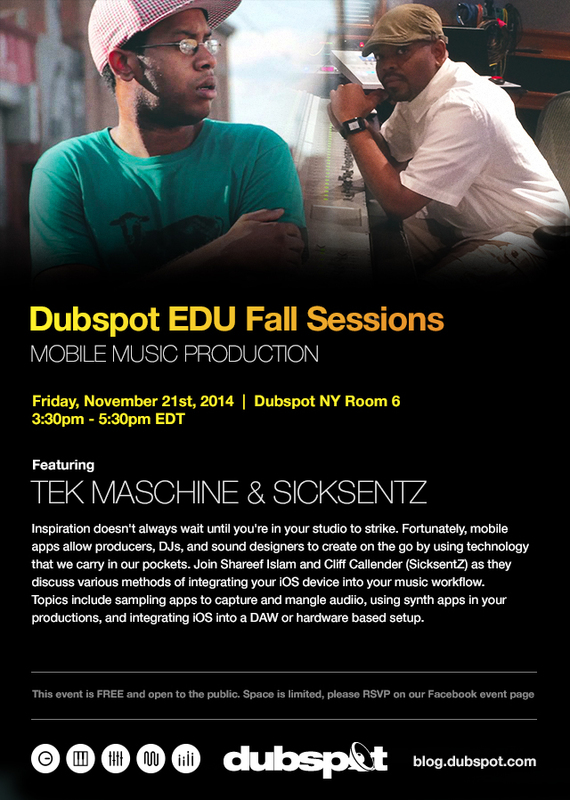 In this workshop, Cliff Callender and Shareef Islam will guide you through how to incorporate your iOS device into your production setup, from sampling and mobile synths to sketch creation on the go. This event is FREE and open to the public. RSVP at our Facebook event page. An RSVP doesn’t necessarily guarantee admission, so please arrive early! Check out a Halloween themed mix from SicksentZ for our Dubspot Radio Podcast. Read an interview here. Shareef Islam is the host of our Reclaiming the Remix series.